The agony of living behind the mask. 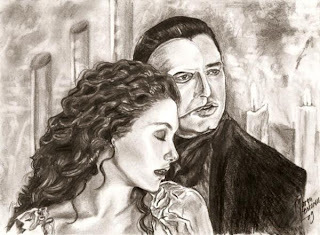 My daughter and I love Phantom of the Opera. When the movie came out we spent endless hours watching it over and over and now, finally, we got to see it at the Venetian Hotel. It was very well done! I could watch that production over and over again! The Venetian built a room specifically for this and it was perfect. No expense was spared and it looked every inch the Opera Populaire. Okay, I'm on Phantom overload! When I got up this morning I had such high hopes for the day, however, those hopes quickly disappeared. By 10:00 I was in the bath with hot swirling water and I stayed there until noon. I was still walking hunched over like an old lady so I just got in bed and stayed there until 3:00. At three I crawled into the shower and managed to get ready just in time for my daughter to pick me up. She was arriving at 4:30 so I wanted to leave plenty of time because I was moving very, very slowly. I also took pain medication. There was no way that I would have disappointed my daughter or myself. We had so looked forward to this evening together. I just knew it was going to be rough. Who's really hiding behind the mask? She asked how I was doing and I, of course, minimized the pain. I hate to hide but I also hate to see her in distress. Seeing me in pain hurts her as much as it hurts me. We had a wonderful dinner and I decided the shoes were coming off. I walked through the casino holding my shoes. The doors opened at 6:30 and we found our seats and sat down. The chairs weren't real comfortable but at that point it wouldn't have mattered if it was a tempur-pedic chair. I was in pain and there wasn't a whole lot that I could do about it. By the time I got home I knew tonight was going to be a bad night. I've already been in the bath, more pain medication and muscle relaxers and it hasn't taken the edge off. I'm in bed with my heating pad watching Phantom again to distract myself but, so far, nothing is working. Every bone in my body aches. Deep down bone-chilling pain and aches. I wish I could go to sleep so I could be out of my misery for awhile. Where's the baseball bat when you need it? It's so surprising to me finding new blogs and even more people out in the world that feel as I do. Hope you were able to get some sleep and pain relief! Ugh! I'm so sorry you are hurting so bad. And all because you wanted to go have some fun. Frustrating. I hope things start looking up soon and the pain eases. As far as The Phantom of the Opera, I LOVE that movie. It is the only movie I ever went to that I immediately walked out and bought the sound track and the movie. It has so many profound messages in it. Just realized that was two things I lost last year so I need to add that to my 'to replace' list. Sending you 'airy' hugs. Please feel better soon. I am soooo sorry my friend!! I know how important it is to do things with your daughter and trying to let NOTHING get in your way!! I am sending you nothing but happy thoughts and prayers that you have low pain days my friend!! I'm so glad that you were able to go see the show with your daughter, but I'm sorry that you had to pay such a high price. I LOVE the Phantom and the Opera. I've seen the show live twice (in London, England and Dallas, Texas), and I own the movie and soundtrack. It's so interesting... such a gripping story. I hope you're feeling more rested. Blessings, dear one. May this find you still unable to find the baseball bat and feeling a little less need to look for it. We do hide behind a mask don't we? (Or at least bravely try!) We hide so much about ourselves from our loved ones so they don't worry about us. Dang. I feel for you. I do this routine every day in spite of the pain, some days are harder than others. I sat through a two hour meeting the other day and had my lower half go from prickling to numb, prickling then on to aching with sciatic nerve pain, and then my face started to prickle and itch, then it went numb and tingling, and then burning before it calmed down. Then my chest and ribs started their special pain that makes me feel like I'm in a trash compactor...love that. All of this going on while trying to concentrate on what my co-workers are saying and what I need to communicate to them. They could tell I was having issues, but I managed to hang in there. I made my gyn-lady doc laugh today when I told her that I love getting my hot flashes and night sweats because FMS makes me so ultra sensitive to the cold, I love being warm! She never heard of a woman who liked them EVER. For once, it was nice to talk to a doctor and have them feel good talking to me! I hope you were able to get some rest. Happy hot baths!! Hey Laura!! I use a product called Mid-Nite. It's melatonin that tastes good and it melts in your mouth. You can also take it in the middle of the night if you wake up. I have this lovely little thing called alpha wave intrusion and it's tough for me to sleep. I feel for your pain while working. God Bless you that you're able to work!! I wish I was still able to do that but between the pain and the medication I'm not able to. I struggle a lot with that concept!! Thanks everyone for the comments!! I still wish that bat was handy!! Ughh so frustrating. :( Hang in there!